The Lur is a large curved horn the size and shape of a mammoth’s tusk. 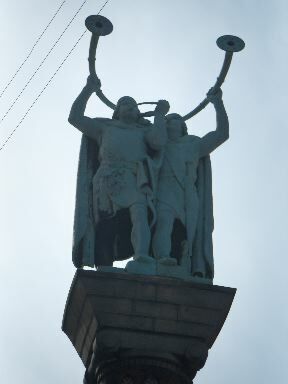 As you can see from the famous statue in the main square in Copenhagen, the Vikings played two together in left and right pairs. This statue inspired the composition of a sonification of yeast DNA for a contest at ICAD 2009 in Copenhagen. The sonification explores the intersection of functional and aesthetic aspects of sonification. The functional design uses a musical motif to signify the start codon. The aesthetic design includes the choice of the Lur (a Viking instrument), and the introduction of pauses for musical effect modelled on a piece of Lur music composed and played by Odd Sylvarnes Lund. This 3 minute excerpt from the 20 minute piece generated from the Yeast gene contains a segment of junk DNA followed by non-junk DNA. Non-junk (intron) regions of DNA start with the sequence ATG (start codon), and end with one of TAG, TAA, or TGA (stop codons). The notes for each DNA element were chosen so that the sequence ATG is a downward fanfare. This fanfare is played 3 times at the start so you can listen for it in the rest of the piece. However you must pay attention because it only occurs once on the bondary between the extron and the intron. As C does not appear in start or stop codons it has been given a very low note that falls outside the motifs formed by the other elements. The piece was made from Lur samples, using Python for data processing, csound for audio rendering, and Audacity for post-production.